It is recommended that cats have access to at least 1 more litter tray, than the number of household cats. Therefore a single cat household should still have a minimum of 2 litter trays, a two cat household a minimum of 3 litter trays and so on. Litter trays should be in different locations and should be at least 1.5 times the length of the cat. 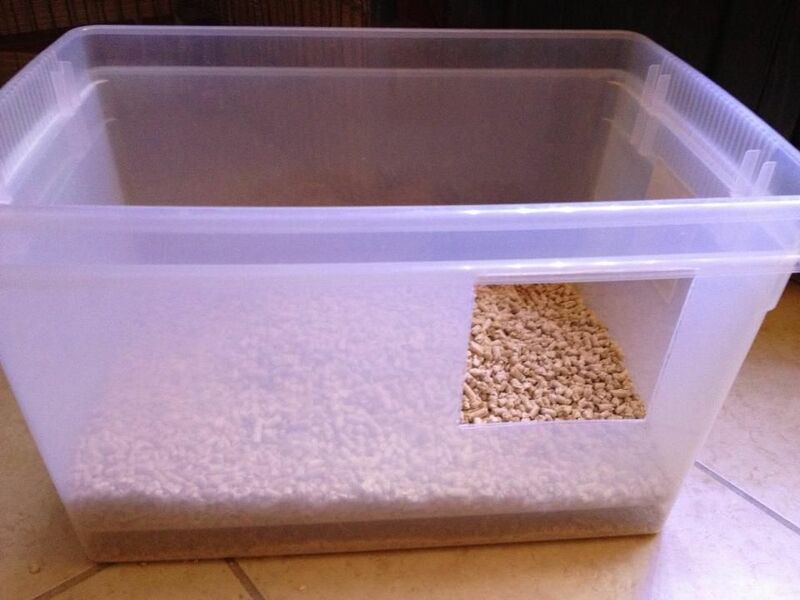 For larger cats, you can make a litter tray using an under bed storage box, or even better use a storage box with high sides and cut out a doorway for easy entrance and exit. The high sides will minimise how much litter is kicked out of the box. The litter should be replaced regularly (at least twice weekly) and the faeces should be removed as soon as possible (at least daily but preferably twice or more). 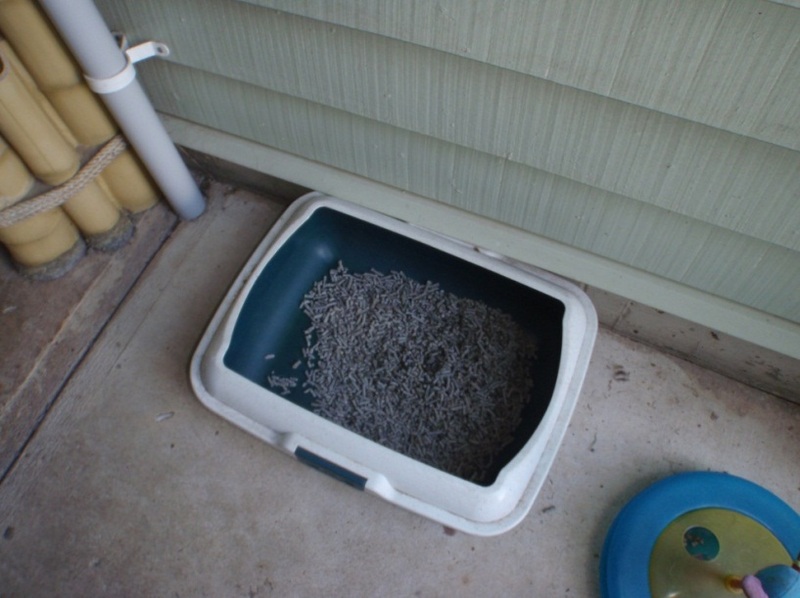 The litter box should be washed using an enzymatic cleaner, rinsed well and allowed to dry in the sun once weekly. Experiment with the litter trays including size, shape, location and litter. Litter trays in multi-cat households should be spread out, so that no one cat can claim ownership of all the trays. Some cats prefer privacy when toileting so having the litter tray in an out of the way private area may help. Avoid locating the litter tray up against glass windows etc as they may feel vunerable in this position. 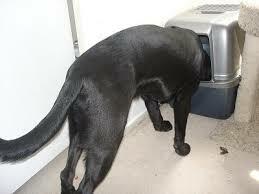 Cats may have a preference for a covered or open litter box. These hurt to stand on! Avoid litters that are dusty and fine as this can promote respiratory disorders in cats, and the hard pebbles are also a killer to stand on. Clumping kitty litters are good in that you can clean them out easily, however if you have a dog that doesn’t mind eating the occasional kitty crunchy, clumping kitty litter can set like cement in the dogs intestines and prove deadly. We commonly use “Breeders Choice” kitty litter in the veterinary clinic that I work in. This is a kitty litter made from recycled newspaper and is environmentally friendly. This was the litter I used too, however it couldn't keep up with the needs of all the cats and we have switched to a walnut clumping litter. Aldi also make a popular low cost litter. We just have to be super vigilant and not allow the dogs access to the tray locations. If you have previously had an outdoor cat that you are trying to retrain to use kitty litter, it may be useful to use dirt/sand/leaves similar to what they were using outside. It is not uncommon for a cat to develop a substrate preference, and choose to use only one type of kitty litter. Often toileting indiscretions are the result of an owners attempt to change the kitty litter with another brand. Please be aware of what is normal for your cat. Observe normal urination posture. If your cat is straining, vocalising, or has blood in the urine take them to a veterinary clinic immediately. Male cats especially, can develop a urinary tract condition called FLUTD (Feline Lower Urinary Tract Disease). This condition results in the formation of crystals in their bladder, these crystals then lodge in the male cats urethra and create an obstruction. 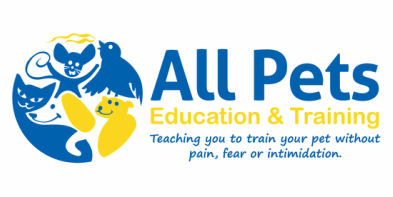 This disease is life threatening and requires immediate treatment and intervention.